WHY GO: Franklin County PA, in the middle of Pennsylvania on its Southern border, was once our country’s “frontier.” In many ways, it still is, as not much has changed, landscape-wise, since our country’s founding. But, of course the Getaway Mavens turn up some pretty impressive reasons to visit: learning about and sampling the hamburger bun that is taking the world by storm right at its source, attending a world-class classical music concert in a luxury B&B where rooms start at $99 per night, Presidential and Civil War history and more. 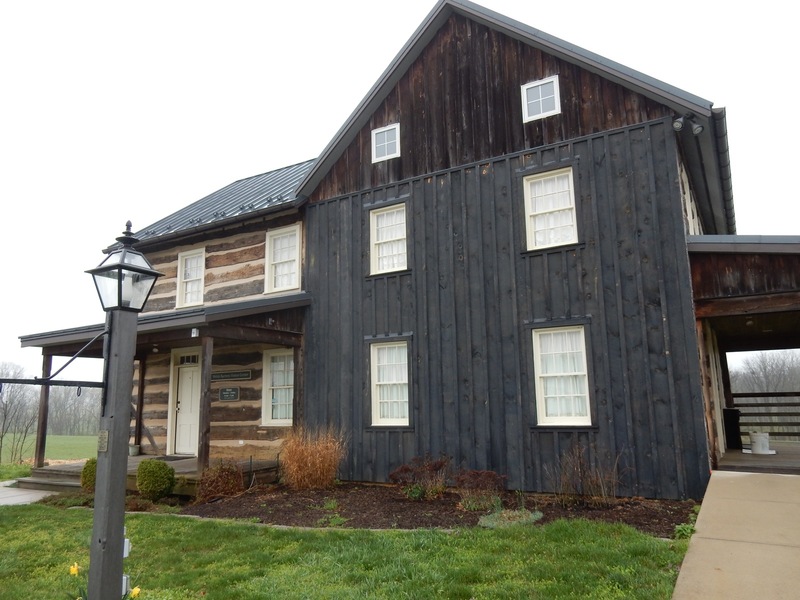 Read on for the best places to stay, eat, and see in Franklin County PA.
VISIT: Martin’s Golden Roll Visitor’s Center. I love “garage-business-makes-it-big” stories, and this one, with a focus on charity, is one of the best. 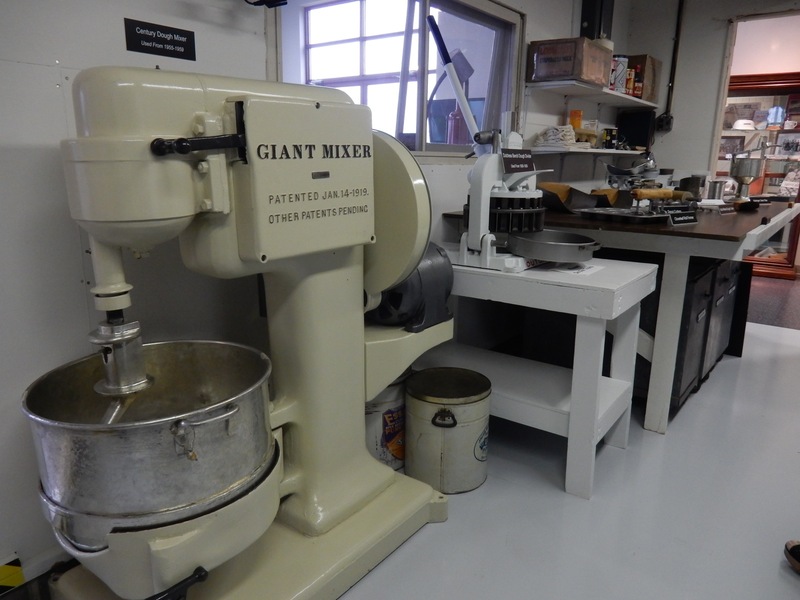 Though you cannot tour the facility, you can get within reach of many of the Martin’s original baking tools and see an orientation video (and of course leave with samples!). And you’ll be within hugging distance of Julie Martin, 3rd generation of a “very close” family, who keeps Martin’s stats proprietary, but doles out warm greetings like no tomorrow. Baking ran in the Martin family. Great Grandma was a maid in a wealthy home, and learned the ins and outs of working with yeast from the resident chef. At that time, less affluent homemakers added cheap mashed potatoes to bread dough to stretch dollars. Grandma Lois was 9 when she was sent door-to-door selling Potato Rolls made from her Aunt’s recipe. 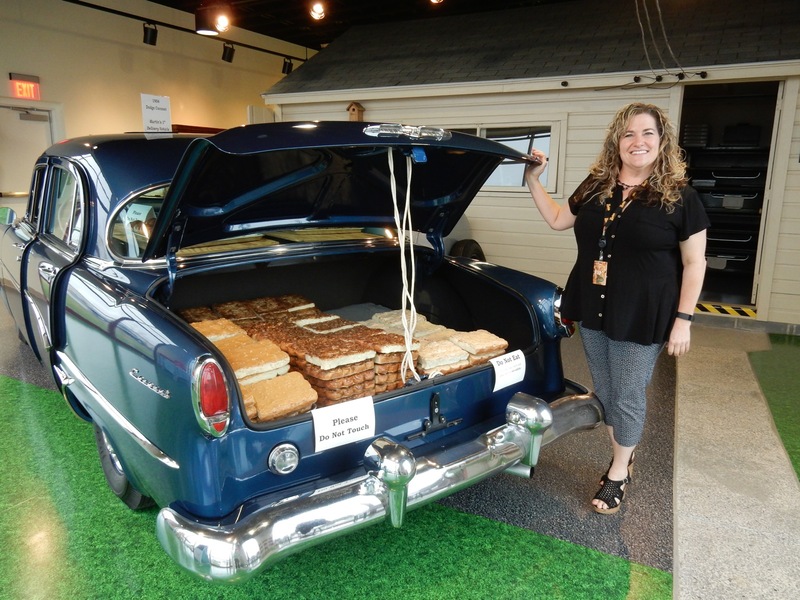 In 1955, Lois and her husband, Lloyd Martin, started baking sticky buns in their garage (displayed in Visitor’s Center), worked all week long, and then loaded up their 1954 Dodge Coronet (replica also in Visitor’s Center) every Saturday bound for the Farmer’s Market. Switching to Potato Rolls, which were much less messy, the Martin’s finally found their niche. And they’ve never looked back. 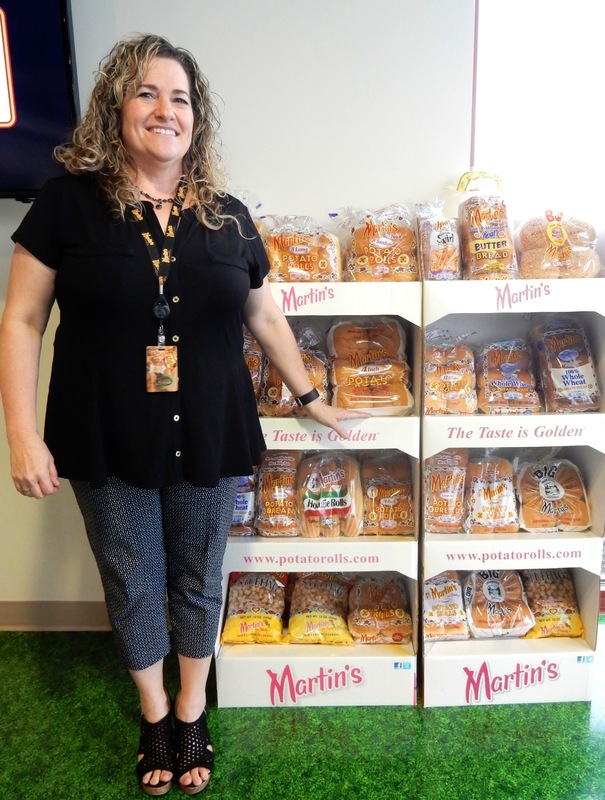 Martin’s Potato Rolls are now the #1 Burger Bun in America – even though they are only sold retail on the East Coast (with Florida and New York the largest markets) and to restaurants around the world (e.g. Shake Shack). The factory, “a marvel of robotic engineering,” can turn out 350 rolls per minute. Though you won’t be able to see it in action, a stop at the Golden Roll Visitor’s Center is the next best thing. Overviews, generally given by the bubbly Julie Martin, are free and by appointment only. 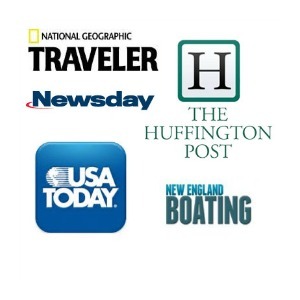 Call 800-548- 1200 Mon-Fri 9-5 during business hours, though can be arranged on weekends as well. 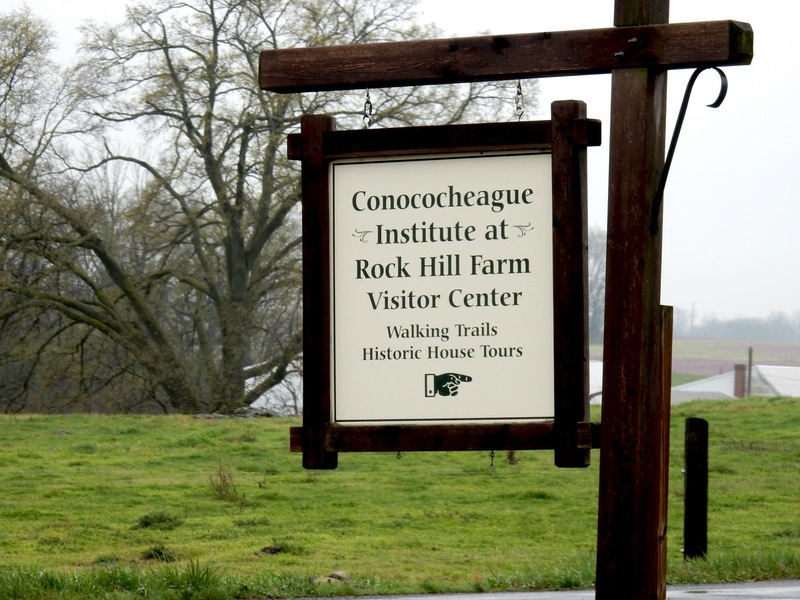 TOUR: Conococheague Institute, Mercersburg. You’ve got to love a place that translates from the Native American (very accurately, I might add) to “A long way, a very long way indeed.” Conococheague (pronounced like “Monica-jig,”), on the National Historic Register, is in the middle of miles and miles of farmland, to the point where you will doubt the veracity of your GPS until the second you see the sign. A very long way, indeed. 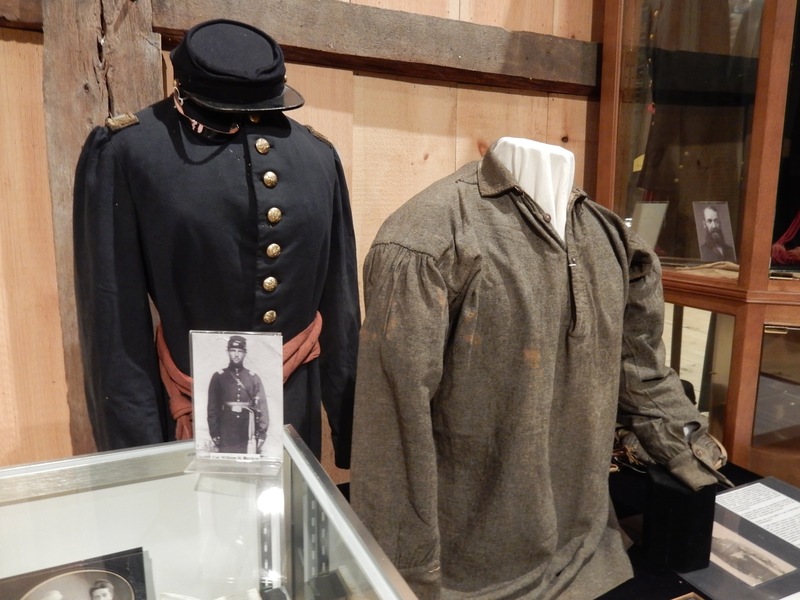 This is by design, as the Institute was established as a Cultural Heritage Center with a mission to “interpret the 18th and 19th century frontier settlements along the Conococheague Creek,” conveying a sense of what it was like to live under threat of the French-Indian Wars. This area was settled by resourceful pioneers, mostly Welsh, in the early 1700’s. They built private home-forts and had to fend for themselves. The Institute owns 30 acres (out of the homestead’s original 800) and several buildings. Start in the Welsh Barrens Visitors Center for an overview and to see an exceptional collection of Native American Projectile Points spanning millennia, and then begin walking the property. In 2016, the 1810 German Style Negley Log House burned down, and is now being rebuilt to historic accuracy. Its substance garden, a typical German four-square, is now mostly maintained by a local High School’s Emotional Support Class (with the guidance of a Master Gardener) and provides a bounty of vegetables that guests can pick and eat. The most historic building, however, is the original whitewashed, green shuttered, 1736 Davis-Chambers House – a “mish-mosh” of several additions, featuring original floorboards. It surely transports you back in time to a remote, austere place. Open Mon-Fri 10-4, $5. PHOTO OP: Buchanan’s Birthplace State Park, Mercersburg. President James Buchanan, like Abe Lincoln who followed him to the White House, was born in a log cabin; in this case one that served as a trading post two miles from town. Buchanan was the only US President from Pennsylvania, and the only one who remained a bachelor throughout his life. Buchanan partially raised his niece, Harriet Lane, after both of her parents died when she was a child. When James Buchanan was elected President, Lane served as First Lady, and was held in high esteem for her gentle nature and appeasing ways. 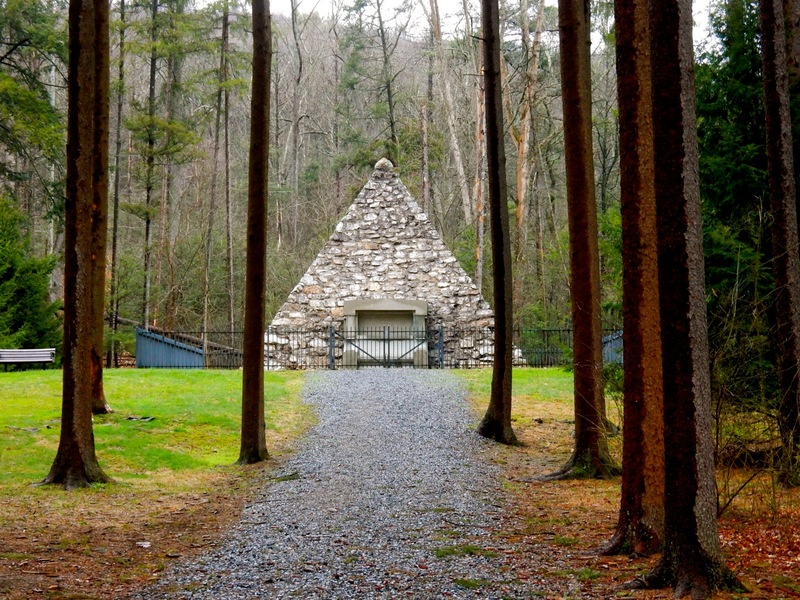 After her Uncle’s death, Lane provided the funds to erect Monuments to him, one in Washington DC, and another marking his birthplace, stipulating that that it be surrounded by parkland that the public could enjoy and the monument itself, a “huge rock or boulder in its natural state.” The resulting pyramid of rocks seems a strange interpretation of Lane’s wishes. Drive into the Buchanan Birthplace State Park about a mile for a quick photo. VISIT: Charles T. Brightbill Environmental Center (behind James Buchanan High School), Mercersburg. Kids (and many adults) go bonkers in this modest but engrossing Natural History museum with its tantalizing African Mammal Room – curated to appear as if all the mounted creatures in New York’s Museum of Natural History were taken from their dioramas and crammed into one room. 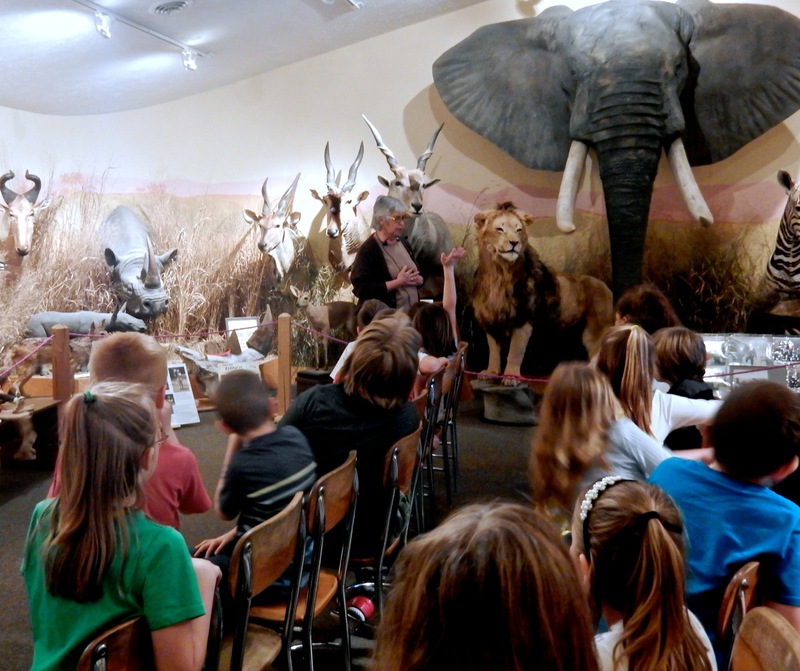 Director and teacher extraordinaire, Sheila Snider, holds big groups of school kids rapt as she engages them, stealthily, in biological and zoological sciences. All taxidermied animals in the collection were donated to this small museum, including those in another “North American Room,” where Polar Bear, Buffalo, Coyote, Deer, Fox, and a slew of others hang from walls or stand in permanent poses. There’s a discovery classroom where schoolchildren learn about geology, biology, and other natural sciences. But really, you’ll want to pop in for the African Room. It really packs a punch. Contact or refer to website for hours. 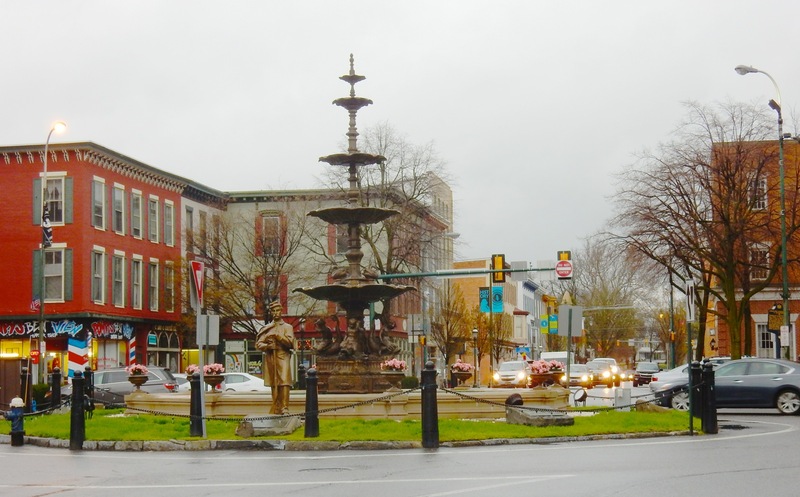 WALKING TOURS: Downtown Chambersburg. Nearing the end of the Civil War, Confederate forces threatened to burn Chambersburg down if the community didn’t cough up $100,000 in gold. A town of poor farmers, coming up with the money was not an option. So on July 30, 1864, all but the Old Jail (which you can tour on its own) and the Mason’s Building were burned to the ground – an event – the Raid of 1864 – recreated with sound and light every year. Most of the remaining downtown buildings were erected after the raid, with a beautiful fountain as centerpiece, and you can learn about them on two self-guided walking tours in Downtown Chambersburg, each about 1.5 miles and an hour to complete. Pick them up in the Franklin County PA Visitor’s Center. 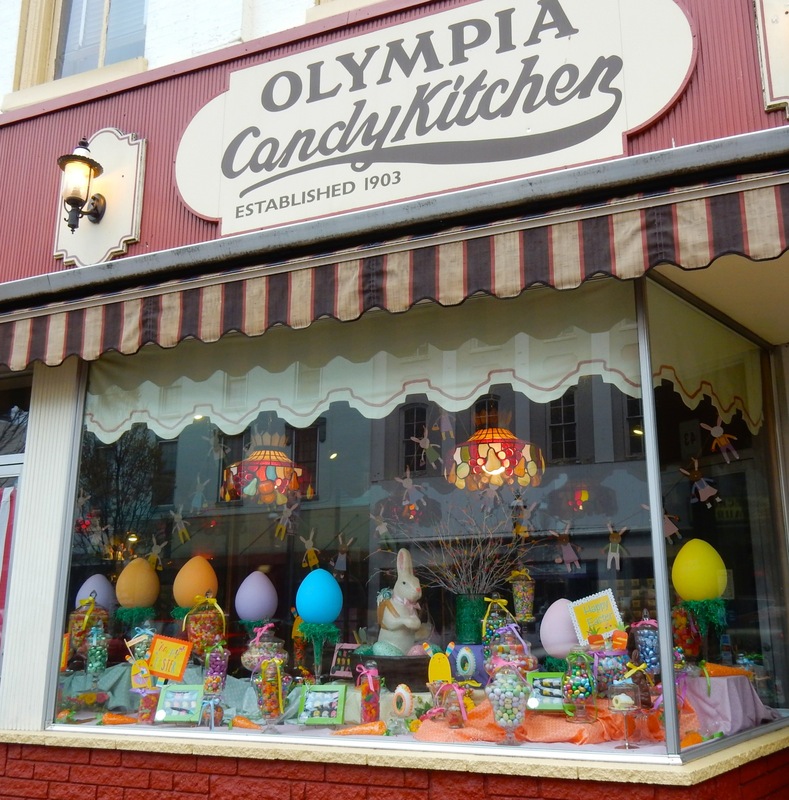 SHOP: Olympia Candy Kitchen, Chambersburg. If you’re looking for a retro candy shop experience, look no further than this local institution, which has been in business since 1903. You’ll find every kind of sweet in here. SHOP: Nathan Miller Chocolate, Chambersburg (adjacent to Roy Pitz Brewery). This is not your conventional candy store. Nathan Miller Chocolate, recently featured in the NY Times, makes everything in this industrial-chic space. 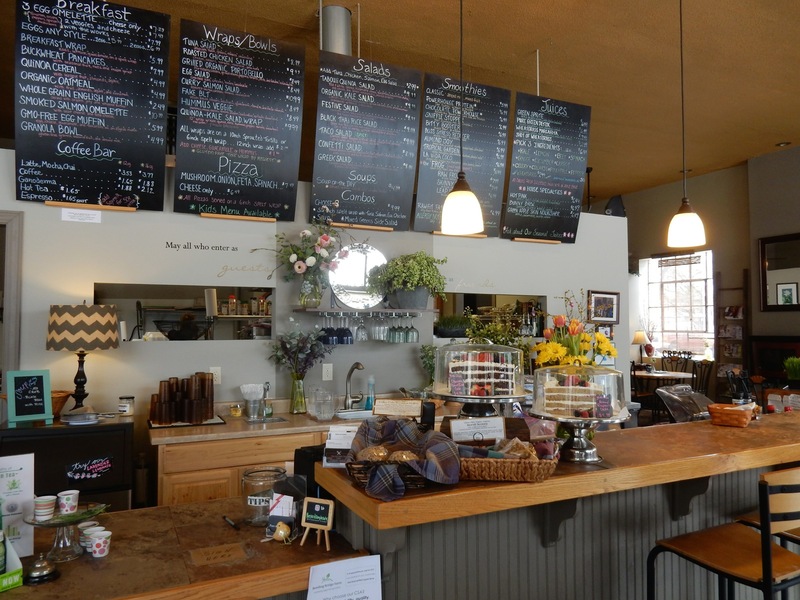 Purchase Everything Bars with Ginger, Buttermilk Chocolate and other gourmet confections ($7.50 per bar), as well as a variety of coffees and pastries. SHOP/TASTE: Tuscarora Mountain Winery Tasting Room, Chambersburg. 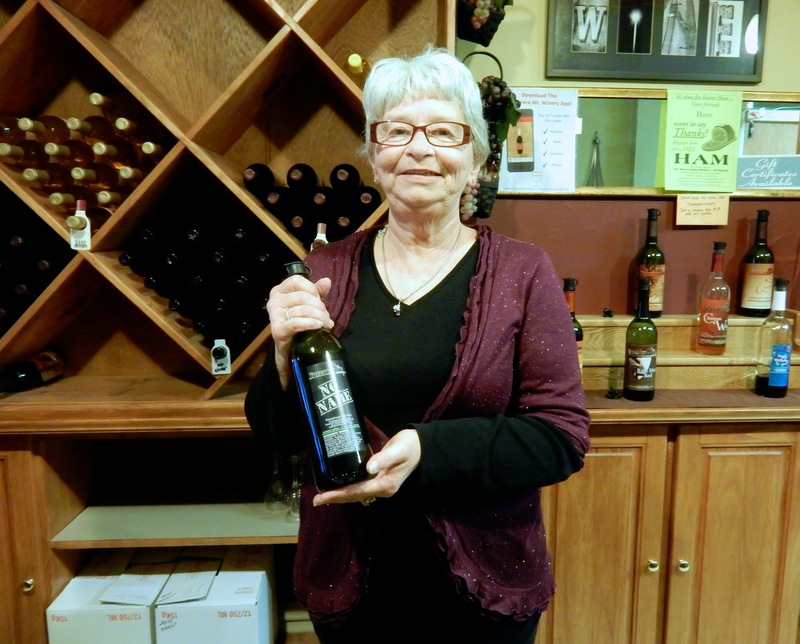 Sue and Ken Hadley own this winery and tasting room, offering free sips of their fruit and grape wines. Though the “1864” Black Current Merlot Blend and “Rifleman Red” blend might satisfy sweet wine palates, my money is on “No Name” – a dry red all berry-blend, inconceivably smooth and drinkable without one drop of grape juice. 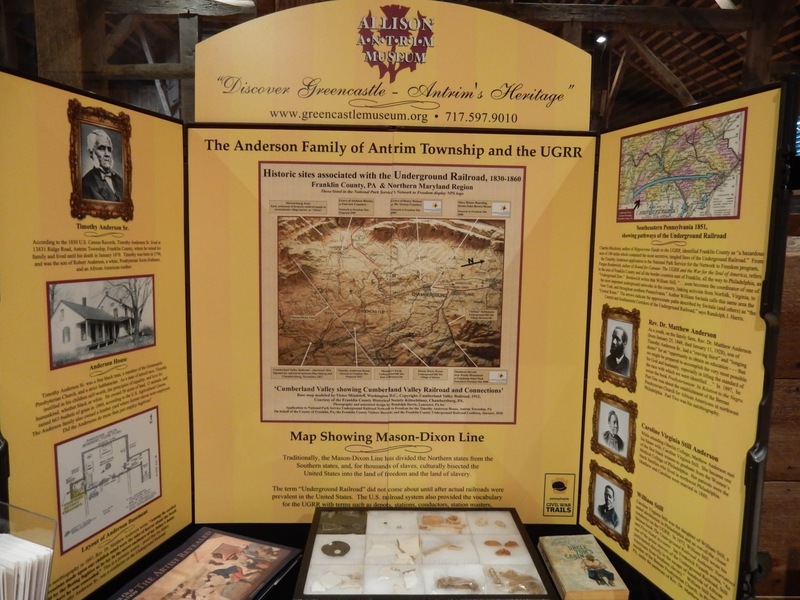 TOUR: Allison-Antrim Museum, Greencastle. For a “hometown” museum, you’ll be mighty impressed, even by the two buildings on an acre of land. The main house was built in 1860 on the eve of the Civil War. The soaring German Bank Barn is impressive in itself. From Chambersburg, it was deconstructed timber-by-timber, stone by stone (color coded by cow tags per each of 4 sections or “bents”), and reassembled on this site. 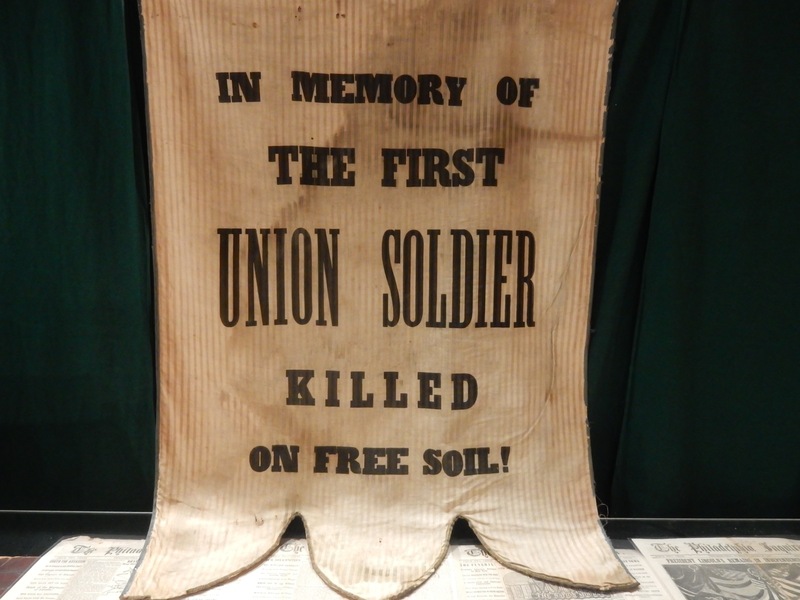 Don’t miss the Civil War Exhibit, leavened with human interest stories. On display is an unwashed shirt with an entry and exit bullet hole in the sleeve. The arm, in this particular case, had to be amputated, and the only regret the wounded soldier had is that he’d lost his wedding ring in the process. Friends went outside to the pile of amputated arms, found the one with his ring, and retrieved it for him. The only thing was, the subject of this legend wasn’t married until after the war, rendering this Civil War tale a very tall one. Among a trove of documents (e.g. original Widow’s Pension, letters from the front) and artifacts (U.S. Army Surgeon’s Kit, a banner honoring the “First Union Soldier killed on “Free Soil” on July 19th 1861, right here in Greencastle), there’s an authentic iron collar used on a slave named Ben who ran away three times before his master had this device made to restrain him. Try on a reproduction to see how heavy and inhumane this restraint was; it will give you the chills. I was most intrigued by the original front pages of the Philadelphia Inquirer dated from Lincoln’s assassination to the day John Wilkes Booth was caught. 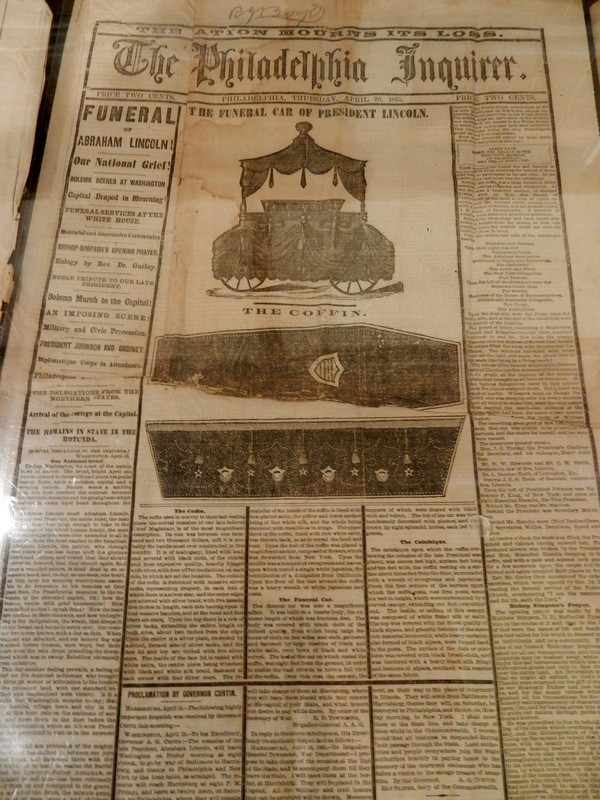 The newspaper educated the public about mourning customs, with photo layouts and interior shots of Lincoln’s funeral train. Perhaps the oddest story on exhibit is that of slave-runner, Robert Anderson, a White Presbyterian who fell in love with the most “beautiful slave woman” on the ship, married her, and became an abolitionist. Robert’s grandson, Matthew, was the first African American to live on the Princeton University Campus while attending Princeton Theological Seminary, (and then Yale Seminary, and Lincoln University where he received his Doctorate), going on to become a prestigious Reverend in the Presbyterian Church. 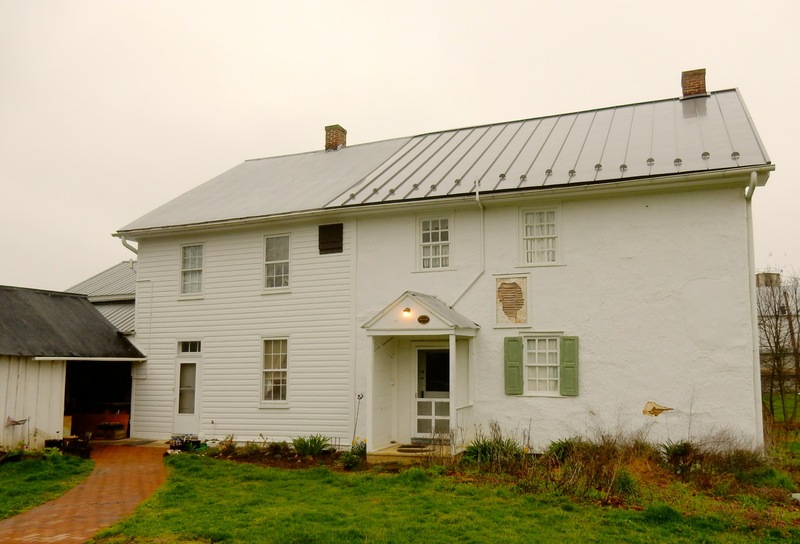 Guided tours (30 minutes) of the 1860 house are offered as well. Rooms are nicely appointed with significant artifacts from establishments and families long gone. 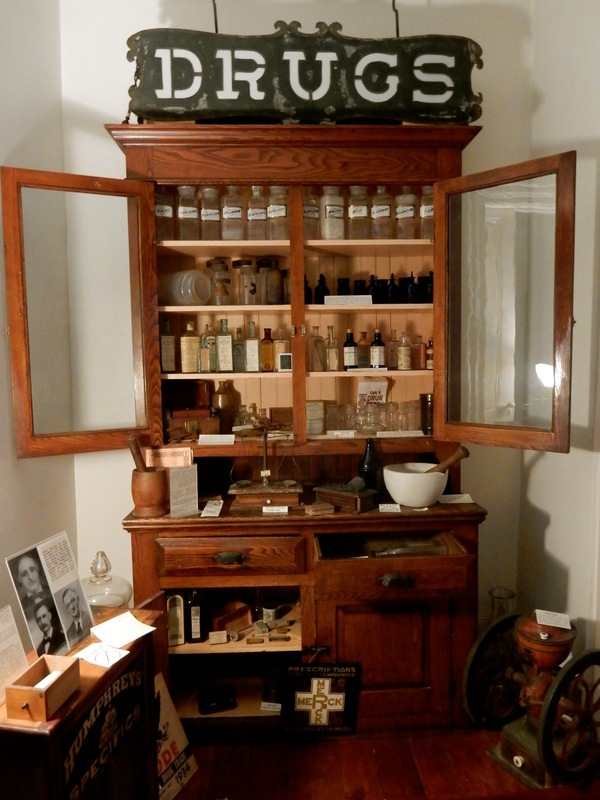 There’s the original 1910 Drug Store sign from a Baltimore St. shop, and beneath it an apothecary cabinet stocked with mortar, pestle, tincture bottles, scales, and weights. 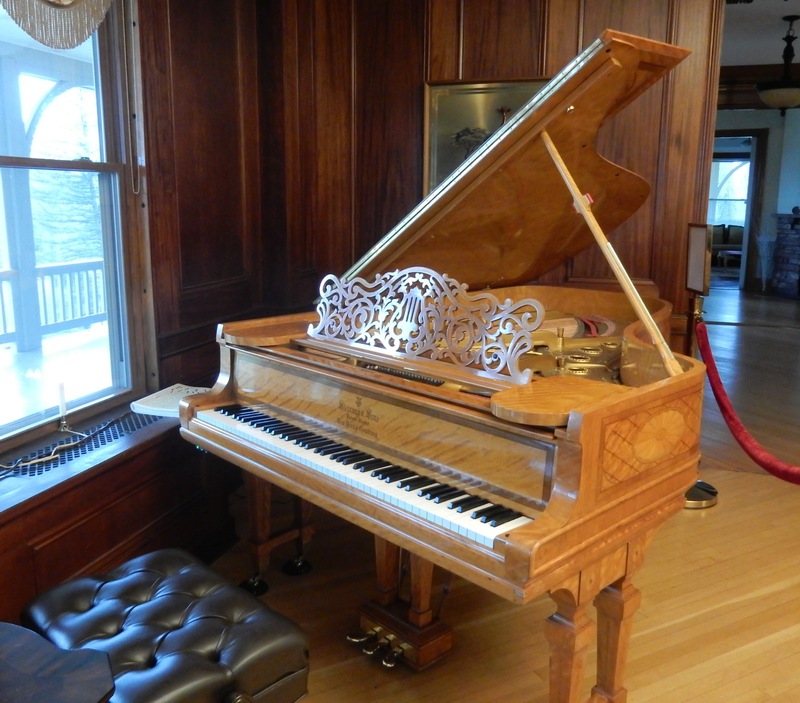 There’s an 1870 Steinway in the “Music Room,” and upstairs, bedrooms and a nursery with a scary looking Buster Brown doll. This area of the house is purportedly haunted by Sophie, a little girl who laughs and enjoys opening the latch on the attic door. Open Tues-Fri. noon-4, Sat. 11-1, Free, though donations gladly accepted. DO: Art Project at Joyful Arts Studio, Greencastle. 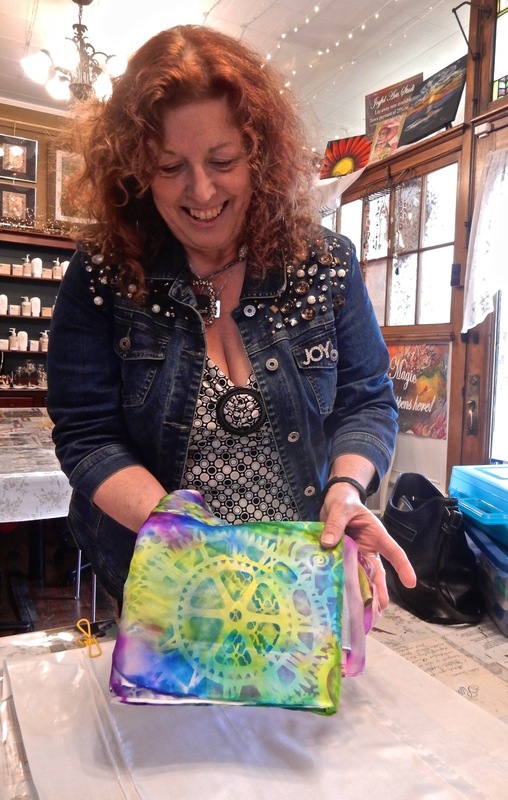 The warm and fun Susan Shaffer is “passionate about the therapeutic power of art,” and invites guests to “create their own joy” at her wonderful shop. Use a rainbow of Sharpies and rubbing alcohol to create a watercolor-style silk scarf ($40), or learn to draw, paint, batik, or make jewelry. Shaffer even has Paint Your Shoes and Wineglass classes. Exercising your creative energy here for a few hours is a great break from all the sightseeing. Check website for calendar. SHOP: The Shop, Greencastle. Though the name doesn’t give you much to go on, this antiques/home-goods store is a must see, even if you aren’t an “antique” person. 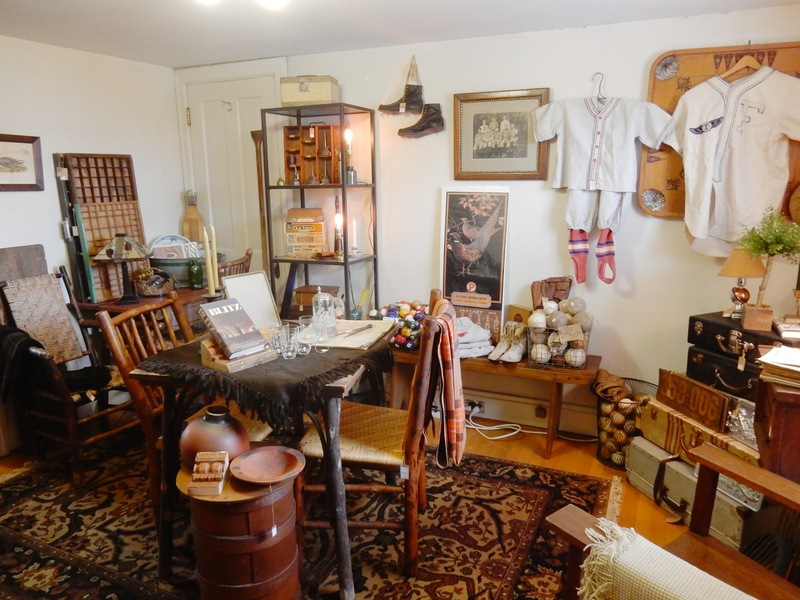 A warren of rooms, a compendium of old and new, you’ll find old timey sports items, linens, signs, jewelry, birdcages, books, lamps, tins, and more in every nook and cranny. Each room is adorably curated. Even if you don’t walk out with anything material, you might leave with some new decorating ideas. 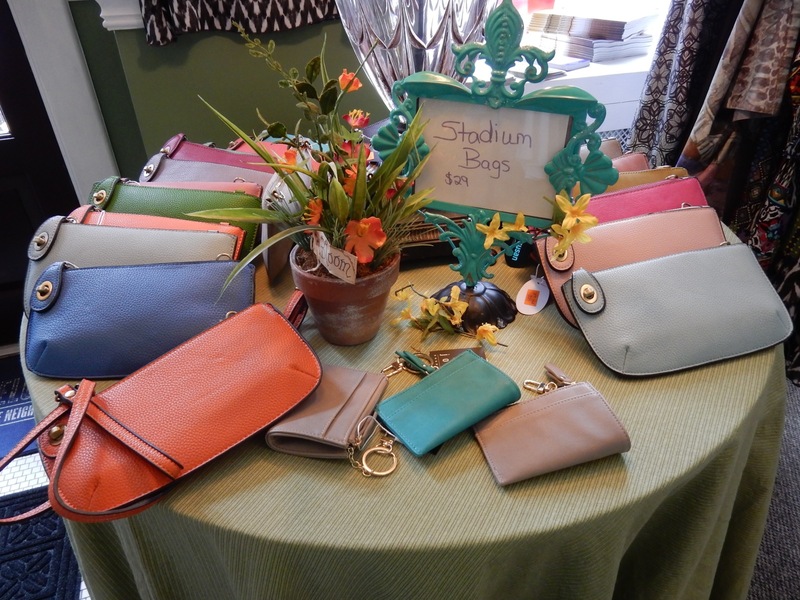 SHOP: Fun little boutiques are springing up in Greencastle. Among them, Inner Beauty and Crown Vetch Cottage for clothing and gifts respectively. 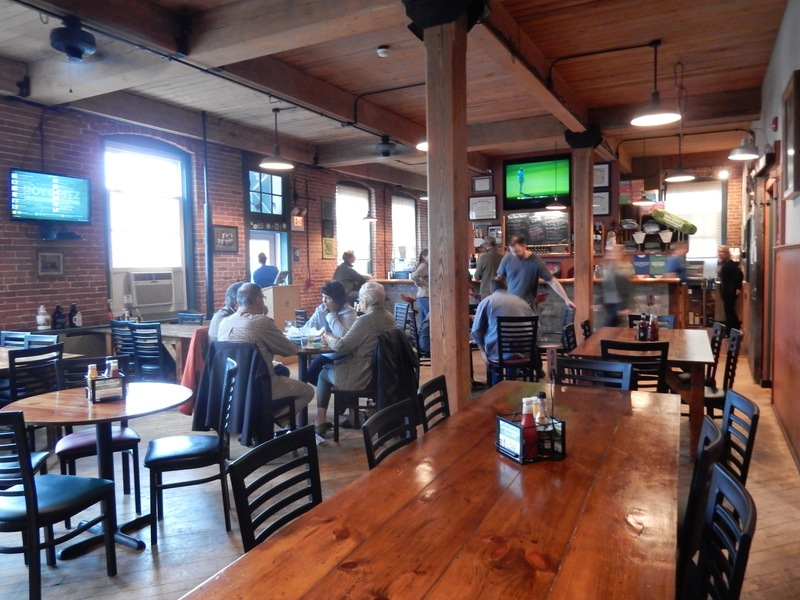 EAT/CASUAL: Roy Pitz Brewing Co., Chambersburg. An upscale pub and brewery, Roy Pitz turns out good beer – like Chambersburg referenced, Old Jail Ale, but sells other libations like Farmer’s Daughter Cider, as well. The focus here is on “local meats,” topped, in many cases, with a portion of kimchi. Entrees and aps, such as Chorizo Tacos and Prosciutto Mac & Cheese ($9-$12) elevate this brewery to Foodie Destination. 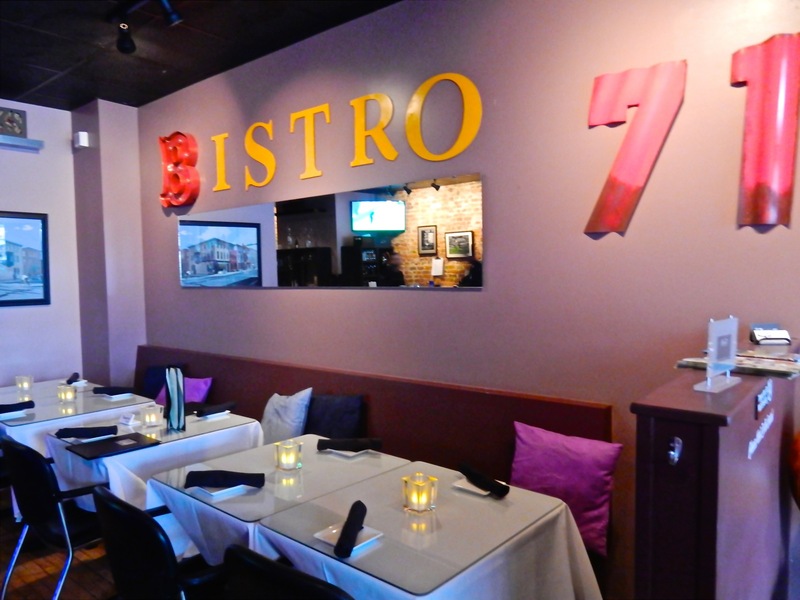 EAT/FINE: Bistro 71, Chambersburg. Subdued lighting, linen tablecloths, cute interior, Bistro 71 is most likely the prettiest place to eat in Chambersburg. It’s also one of the best, with expertly prepared fresh Caesar Salad and entrees like the very fine Wanton Crusted Spiced Ahi Tuna with Ginger Soy Lime ($24), Rack of Lamb ($28), and other toothsome dishes. 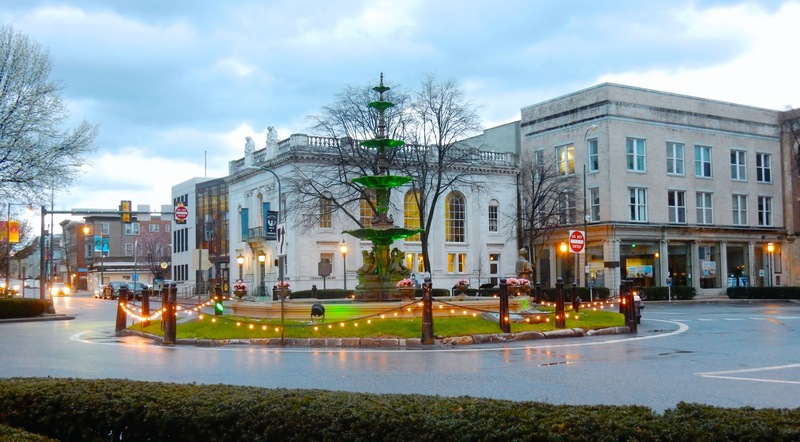 EAT: Chambersburg locals also recommend Brussels for crepes and coffee, Café D’Italia for fine Italian food, and Molly Pitcher Waffle Shop for old-fashioned and creative waffles both sweet and savory. EAT: Stoner’s on the Square, Mercersburg. Formerly the Est. 1860 McKinstry’s Tavern & Pub, and then Flannery’s, Stoner’s serves up some good, higher end pub grub. Salads are terrific (Wedge – $6.99, Black and Blue $12.99) and so are Pot Stickers. There’s requisite (for an Irish Pub) Banger’s and Mash ($14.99), steak, and chicken as well. EAT: Pure and Simple, Greencastle. Get your Banana-Chocolate Smoothie ($6.99), Maryland Crab Soup ($4.99), and other organic baked goods and vittles at this country-cool spot that wouldn’t look out of place in downtown Manhattan. A big surprise in small-town rural PA.
STAY: Inn @ Ragged Edge, Chambersburg. The Inn at Ragged Edge is a wonder of woodwork, the stream-view out of the massive picture window, breathtaking, but it’s the 1901 Steinway piano – commissioned by Harrods’s of London now sitting in the stately parlor – that beckons World Class musicians and romantics of all kinds to this rural area of Chambersburg halfway between Gettysburg and Antietam. A “Maven Favorite” – we wrote up a complete feature HERE. STAY: Mercersburg Inn, Mercersburg. This classic luxury country inn is preferred by parents of Mercersburg Academy parents, and maintained beautifully. $200-$395 per night.